Trying to get more tasks completed in a day might seem like an impossible task, but if you improve some of your daily tasks you might find more time for the other things you need to do. You control your own routine; making changes and seeing the positive results can help you push further, but it is important that you know your limits too. Don’t take on more work than what you can actually complete, this will make you seem disorganized and unprofessional no matter whether it is for work or home life. Sometimes your routine can become stagnant because of a lack of focus on the routine, a sign meaning the start of something new. For me it is fighting the start of the new day. I am not a morning person and any delaying tactic I can use, I will. I found that it can take a lot to push me forward in the morning and mostly I just need to refocus my routine. To get me to refocus I set a time limit, a point where I have to move and start the tasks. I don’t have difficult tasks, it is just the thought of starting the day and fighting the urge to have one more cup of tea. 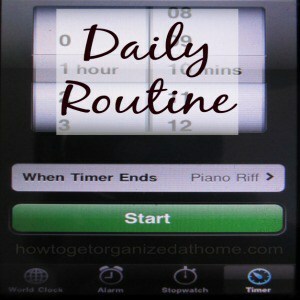 The routine that I have in place has no difficult challenging tasks and this does make it easier for me in the morning. It is important that you consider the focus of your routine and see if there are elements that would work better at a different point of the day, or even a different order to help you refocus your attention to your routines. If you are looking at making a change to your routine, or you are looking to fit more in, then you need to assess the current situation to ensure that you have considered all options. You can’t improve on something if you don’t know or understand what is wrong. Therefore, it is important to deconstruct your routine to find the element that is holding you back from completing more and to put positive steps into your routine that will push forward the obstacles, which have kept you back. You need to look at your routine objectively and think about what you are doing and when, it could be that you might need to switch out some activities to make your routine flow. I know it is the point when I sit down to eat my breakfast that I have no momentum to get back up and continue forward with the day, which is why I gave myself the permission to do this as long as I was back into my day by a certain point. This was liberating because I thought I had to be firmer or change something drastic and not just give myself the five extra minutes that I needed. This change has a positive effect on the day. I have given myself the permission to take this extra time, I plan it into my day and I am not playing catch up, with the jobs and tasks I need to complete for the rest of the day and surprisingly I can actually accomplish more. Therefore, if you are looking to improve your routine and to accomplish more, then it might be time to look at your current routines and assess them to ensure they are meeting your current needs, or whether they need changing or amending to make your day go smoother with less stress and more tasks completed.